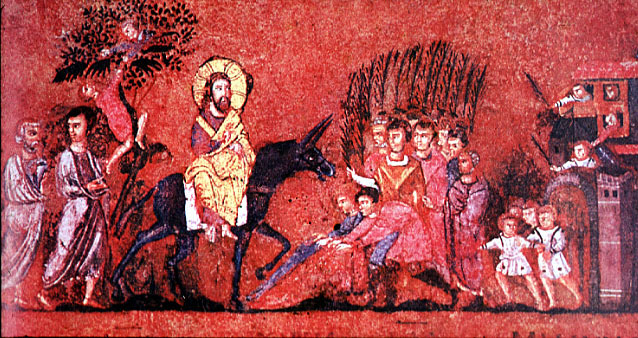 The Palm Sunday narrative is one of the few that is included in all four Gospels. We read the version in John. But there are significant differences. Matthew and John quote Zechariah’s saying about the king of Jerusalem riding on the colt of a donkey. All of them have the words of praise that greeted Jesus, which are quoted from Psalm 118: “Save us, we beseech you, O Lord! O Lord, we beseech you, give us success! Blessed is he who comes in the name of the Lord. We bless you from the house of the Lord” (verses 25-26). The word hosanna comes from two Hebrew words, hôshia nā, which became ὡσαννά in Greek. It literally means “save, we pray,” as in Psalm 118. This word was used during the Feast of Tabernacles (or Sukkot). Once a day during the feast, worshipers would walk around the altar and say, “Save now, we beseech thee, O Lord! We beseech thee, O Lord, send now prosperity!” When the priest reached a certain point in the ceremony, a trumpet sounded and all the people waved branches of palms, myrtles, willows, etc. Since Jesus’ entry into Jerusalem takes place around Passover, rather than the Feast of Tabernacles, it is unclear why the crowd would wave palm branches and shout “hosanna.” Ironically, it is salvation that Jesus brought – but not the kind the people were singing about. Matthew – Hosanna to the son of David. Mark – Blessed is the coming kingdom of our father David. John – Blessed is the king of Israel. In Matthew – Jesus goes to the Temple and threw out all the vendors and money changers. In Mark – Jesus also goes straight to the Temple, looks around and then returns to Bethany for the night! In Luke – Pharisees go to Jesus and ask him to stop his disciples from saying words of praise. Jesus responds that if they were to keep quiet, the stones would shout! Jesus then wept over the city of Jerusalem and its unfaithfulness. Then he drove the vendors out of the Temple. In John – Pharisees speak under their breath and observe that everyone has gone over to Jesus! Clearly we have on Palm Sunday a mammoth demonstration of God’s politics. And if these confrontational words and actions were not enough, the very entry of Jesus into Jerusalem was full of potent symbolism. Jesus taught in parables. His miracles were parables. His entire life was a parable. Remember, the Word became flesh – a living, acting person! Paul wrote that we should be imitators of Christ – who, though he was God, emptied himself, lowered himself, even to death on the cross. The symbolism of Palm Sunday was deep. Jesus entered from the east, from the Mount of Olives. In contrast, the Roman governor – Pilate at that time – lived on the Mediterranean coast in Caesarea, and thus entered Jerusalem from the west, riding on an impressive stallion and accompanied by an impressive show of military pomp and might. Most people likely stood silent as they watched the military procession. The contrast with Jesus’ entry couldn’t be greater. This was political theatre in no uncertain terms. But the irony was not only aimed at the Romans. The people greeting Jesus with those words of Hosanna and Blessed is the king, etc., have it all wrong about Jesus. Jesus rides on a donkey. He is not the Messiah they are expecting, not the military leader to drive out the Romans. It is no surprise that many of those shouting “Hosanna” will shout, “Crucify him,” in just a few days. In all these conflicting expectations and politics, Jesus is the calm center. A few times he raises his voice, as in tomorrow night’s a Gospel reading, but he remains mostly the calm center. And he is still today that calm center in the midst of all our confusing voices and fears. Yesterday we heard in the Epistle reading, “Jesus Christ is the same yesterday, today and forever” (Hebrews 13:8). And it seems human beings will be the same yesterday today and forever! Our situation is not different. Leader after leader disappoints us. Leaders come and go, political ideologies make promises, but the poor are still with us. Jesus himself said that the poor we will always have with us. And it’s more true today than it was in his time. Violence and crime are still with us. Jesus’ kingdom has not removed the tragedy or pain or injustice of the world in which we live. But we still believe that it’s here, in our midst, in us. It exists wherever hope exists. Hope, faith and love. These three. They define the kingdom – not power or violence. Faith hope and love enabled the Son of God to enter Jerusalem and ride to his death – and resurrection. He invites us to enter with him, not cheer him on from the sidelines – but to enter with him. Blessed are we who come in the name of the Lord. We bless you from the house of the Lord! Categories: Sermons | Tags: God's politics, Hosanna, Messianic expectations, Palm Sunday | Permalink. Yes and Amen, Kostas! But we have to start spelling out what the politics of Jesus might look like now. if it just looks like Democrat rather than Republican (USA) or Labour rather than Conservative(UK) that doesn’t do the reputation of Jesus much good. How do faith, hope and love make a difference? What do they have to say for example about nuclear weapons or fracking? These are questions I ask myself really…..
Clearly, Jesus would have nothing to do with party politics US or UK style. But what would he have to say about nuclear weapons or fracking? I think the same thing as he said about the poor and the homeless. Who benefits from nuclear proliferation or fracking? Not “the least” of his brothers and sisters, that’s for sure! The leaders and the powerful that he condemned and who condemned him are the ones who benefit. Faith, hope and love never motivate the actions of the powerful. But how do they motivate OUR actions? That’s the question for you and me. I don’t know about the UK, but here in the US the majority of those who call themselves “Christian” are more attached to party politics and cheap slogans than to actions consistent with the values of Jesus Christ. Jesus is neither Democrat or Republican, Labour or Conservative – but I don’t have to speculate about the politics of Jesus, they are clearly spelled out in the Gospels. The challenge is not to figure out where he would stand today – but where I stand.